VATICAN CITY (CNS) — Why do so many young people leave the church after confirmation, Pope Francis asked bishops from Portugal. “There is no doubt that Jesus exists; but where are we hiding him?” the pope said. 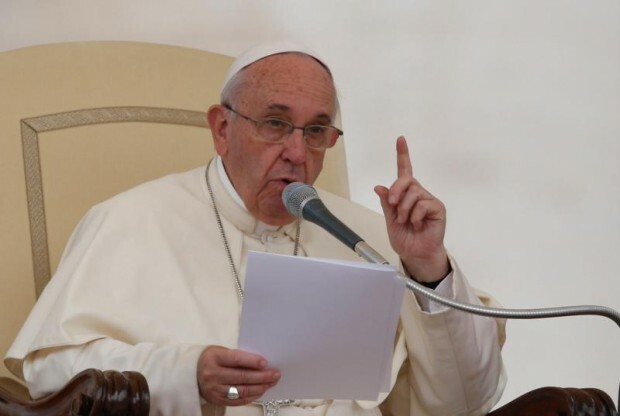 What is required is “a personal and pastoral conversion of pastors and faithful so that everyone can say truthfully and joyfully: ‘The church is our home,'” he said in a written speech handed to the bishops during their meeting with the pope Sept. 7. The bishops were making their “ad limina” visits to Rome to report on the state of their dioceses. Pope Francis asked the bishops not to lose courage before the many challenges facing them and their parishes. One of the challenges the pope highlighted was “the large number of adolescents and young people who abandon practicing the Christian faith after the sacrament of confirmation.” He also noted the lack of specific programs to help young people continue their formation, which could help prevent them from entering into “irregular” relationships later. “All of us cannot help but be worried about this escape by youth that happens precisely at the age when they are taking over the reins” and gaining greater independence in life, he said. “Let’s ask ourselves: Young people are leaving — why are they making this decision? Is it because they are not interested in the gift they have received? Are they not interested in what they were offered because it does not respond to the problems and questions that worry them today?” he asked. Using the garment worn at first Communion as a symbol of the faith young people receive, the pope asked whether kids today no longer have any use for such attire, have replaced it with something else or if the Christian community is possibly trying to force them to wear it? Jesus’ promise of eternal life has convinced so many, but today, “our proposal of Jesus is not convincing,” he said. Perhaps the church’s catechetical materials have done a good job presenting the life and teachings of Jesus, but what is probably harder is getting people to actually encounter him through the life and witness of catechists and the church community, he said. The pope asked that the “scholastic model” of teaching about Jesus be replaced with a “catechumenal” approach that does not just impart “cerebral knowledge, but also a personal encounter with Jesus Christ” that focuses on listening for the specific vocation God is calling each person to live. Jesus is walking with today’s young people, the pope said. The problem is the prevailing assumption today that everyone is an “apprentice-creator of oneself and completely intoxicated on freedom.” That makes it difficult for people to understand the idea of being called to a vocation, the pope said. “He loves us too much to abandon us to chance” and devoid of gifts and goodness, he said. Even though the world tries to deceive people into believing otherwise, “our happiness fully depends on our knowing how to figure out and follow the call to that mission” God has in mind for everyone, he said. Parents need to continue taking children to Sunday mass. When they fall away, so do the children. Back in the 50s and 60s, most Catholic children attended Catholic school. We had the opportunity to live our faith every day. Sunday was, not only a day of rest, but a true family day – beginning with Mass. If we didn’t go to Mass, we didn’t go anywhere else either. I often wonder why people (whose children attend public school) make such a big deal about First Holy Communion and Confirmation, and then pull their children out of religion classes after 6th grade. Maybe parat of the solution is to administer the Sacrament of Confirmation in the 8th grade, and not the sixth. The children who attend public school would, then, have an additional 2 years of religious instruction. If it were important to the parents, they wouldn’t disappear. At least in the immediate years following Confirmation. THE BREAKDOWN OF THE FAMILY The family wife husband must pray together. I think there are many reasons young people leave the church after confirmation. Unfortunately they leave for some important reasons we can not control. When I grew up being Catholic was a total experience. I went to catholic school and received classes in religion every school day all the way up through HS. Most Catholic kids today do not go to Catholic school because most of the schools have disappeared. When I went to West Philadelphia Catholic HS for Boys we had a total enrollment of about 2500. Now the school no longer exists although I’m glad to see a small remnant of it has risen from the ashes so to speak. So I don’t know what the answer is but it is a problem nationwide. Parents used to feel it was an honor if one of their children wanted to become a priest, nun or Christian Brother. Now, not so much.